Independent hoteliers face a lot of challenges when it comes to occupancy levels, OTA commissions, room rates, and more. The last thing hoteliers need is to constantly manage fluctuating data in an attempt to maximize revenue per available room. In our most recent webinar, “How Digital Marketing Can Transform Revenue Management,” I joined Darlene Rondeau, VP of Best Practices at Leonardo, to talk about the importance of collaboration between Director of Sales and Marketing (DOSMs) and Revenue Managers in solving these hotelier challenges. Bringing these two teams together to understand and efficiently market to your guests boosts your bottom line. If you weren’t able to attend the webinar, I encourage you to watch the full recording and to read the recap of what I covered below. It’s paramount for both DOSMs and Revenue Managers to work together to prioritize direct bookings that help your bottom line. This doesn’t mean abandoning your OTA strategy completely. Rather, emphasizing direct bookings drives nearly double the value for hoteliers compared to bookings received through OTAs. Another benefit of direct bookings is the power and flexibility of owning the guest relationship. When you are in charge of your guest’s information, you have the opportunity to upsell to them at checkout, or after they book with you. Here, DOSMs and Revenue Managers work in unison to figure out which messaging and price points, among other things, will maximize revenue. 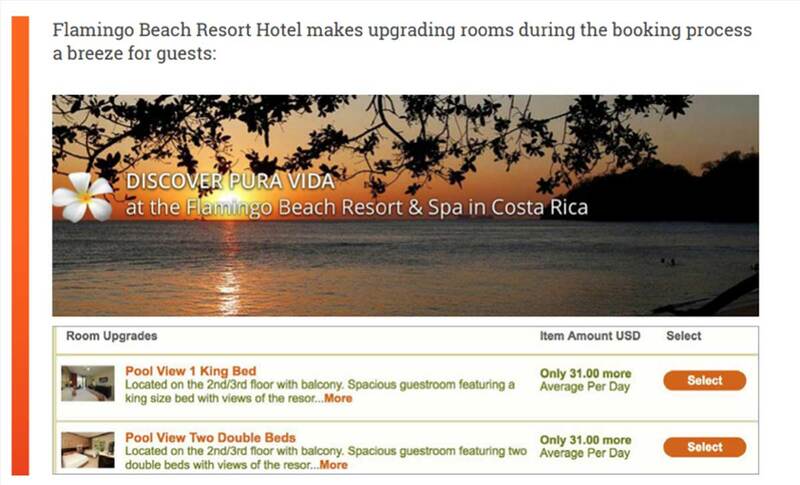 As in the case with Flamingo Beach Resort Hotel, a guest making a direct booking can see in the checkout process that an upgrade for their room is only $31 a day. If they select the upgrade, that money is going straight to your bottom line. When you upsell to your guests through direct booking, you can both increase revenue, and create the best possible experience for those who stay with you. When guests book through OTAs, they may not receive the most up to date information. This leads to confusion and disappointment once they arrive. If what they see is not what they get, a customer is less likely to add on amenities, recommend you, or become a loyal guest. The challenge to fit into the OTA mold has large implications for both DOSMs and Revenue Managers who rely on satisfied repeat guests. When hoteliers own their guest information they can both take control of how their hotel is represented, and use their knowledge of customers to personalize packages and messaging. Understanding your audience improves your guest relations and helps you reach your direct booking goals. Both teams, DOSMs and Revenue Managers, can capitalize on audience demographic insights. Applying this data to your marketing strategies helps tailor your messaging in campaigns, both Sojern-specific and others. It also informs which hotel amenities, specials and packages align with the interests of your audiences. For example, a person traveling solo for business will have different wants and needs than a family traveling for leisure. Knowing who is traveling is just as important as knowing where they are traveling from. Knowing your audience and which source markets they come from affect both DOSMs and Revenue Manager priorities. As a DOSM, you can use data like those illustrated in the chart below, to give you insights on your top feeder markets. 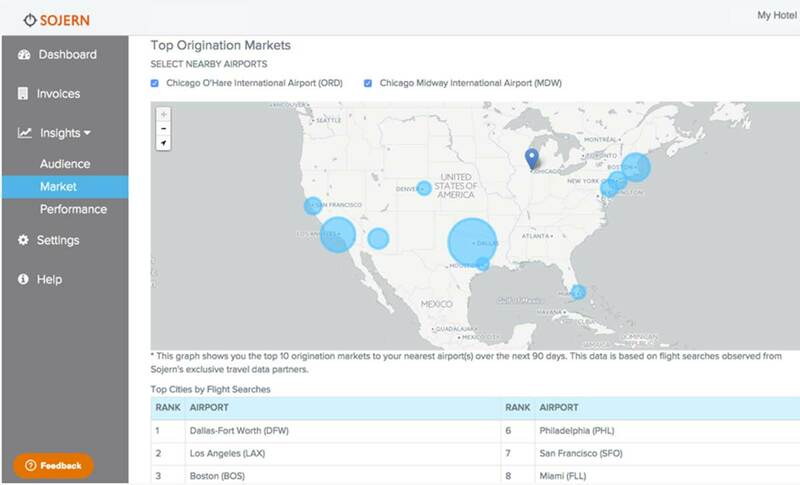 With these insights, you can answer questions such as, “In which top ten cities have people searched for travel to your area and market?” or “When is travel demand picking up or cooling off?” As for Revenue Managers, you can adjust rates based off the answers to such questions. Last but not least, it’s important for your teams to evaluate the kind of booking your marketing programs drive. Do you drive more last second bookers or traveler planners? What is the value of these customers? How are you allocating inventory to distribution channels? Sojern’s Booking Insights helps DOSM and Revenue Manager evaluate and answer these questions to help your hotel have a better marketing and revenue strategy that increases your bottom line. To find out more, check out the entire webinar recording. To succeed at hotel revenue management and online marketing, Revenue Managers and Digital Marketers need to break down silos and work together closely. 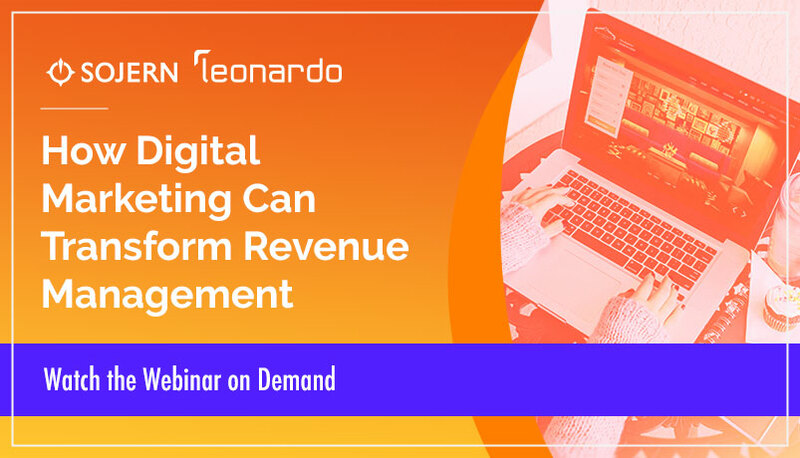 In this webinar, experts from Sojern & Leonardo walk you through the steps you need to take to bring digital marketing and revenue management together. Specializing in traveler path-to-purchase data for over a decade, Sojern is travel’s direct demand engine for thousands of brands—from global enterprises to boutique operators—across the hotel, airline, cruise, transportation, tourism industries and more.